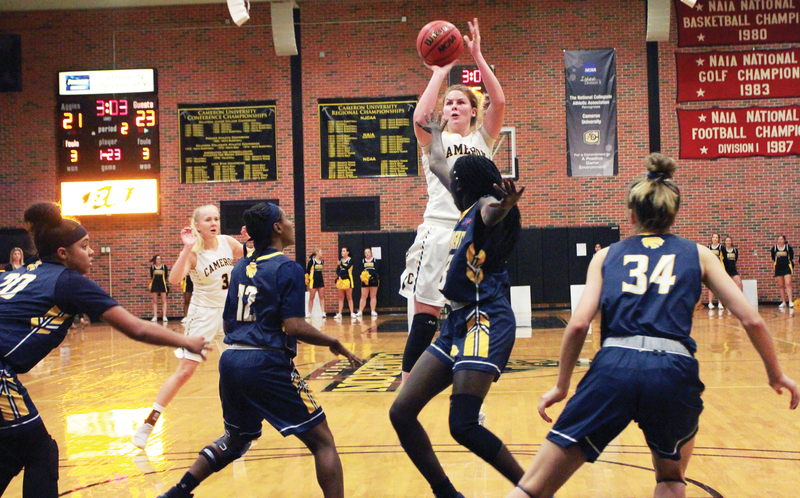 One jump ahead: Sophomore Jamie Bonnarens goes for a jump shot against Texas A&M-Commerce’s Brianna Wise in the Lone Star Conference opener on Nov. 30 in the Aggie Gym. Bonnarens tallied a team high 22 points and added 12 rebounds for her second double-double of the season. The Cameron women fell 79-69 in overtime. Cold shooting doomed the Aggies on Lone Star Conference opening night against Texas A&M-Commerce as Cameron fell 79-69 to the Lions in overtime on Nov. 30 in the Aggie Gym. Cameron’s 32 percent shooting from the field hurt them coupled with 20 turnovers the Lions cashed in for 16 points. Both teams shot 25 percent from out deep, with TAMUC going 3-for-12 and the Aggies 8-for-32. Additionally, CU shot 65 percent from the stripe, and the Lions shot 63 percent, sinking 24-of-38 free throws. Both sides grabbed an even 48 rebounds. Sophomore Jamie Bonnarens led the Aggies with 22 points and added 12 rebounds for her second double-double of the season. Redshirt junior Parfitt McNair scored 18 points, and junior Amaka Nwakamma tallied 11 points. Junior Lejha Smith tallied 14 rebounds and three blocks. Sophomore Ava Battese had a poor shooting night as she missed all ten of her three-point tries and had just three points. Entering league play, Battese averaged 3.6 three-pointers a game and was the Aggie’s second best scorer behind Bonnarens. For the Lions, senior Brianna Wise led with a career high 26 points. Graduate Melanie Ransom, senior Artaejah Gay and sophomore Jenna Price joined her in double figures with 14, 13 and 12 points, respectively. Prior to the contest with the Aggies, Gay was three points away from 1,000 career points, which she reached in Thursday night’s game becoming the 12th Lion in program history to reach the milestone. Price added 14 rebounds for the game’s only other double-double. Cameron experienced cold shooting in the opening half, shooting just 25 percent from the field and only made 2-of-11 three-point tries. The Aggies experienced their largest lead of seven points in the first quarter after freshman Andrea Martinez hit back-to-back treys to put CU up 18-11 with under a minute remaining. In the second quarter, the Lions found their first lead since the game’s opening bucket. With six minutes to go until the half, CU fouled the Lions beyond the arc, but junior London Holland only made one of three free throws to tie the game at 19-all. After another tie at 21, TAMUC scored on three layups to take a 27-25 lead at the buzzer after out-scoring the Aggies 15-7 in the second period. The third period saw tightly contested action with four ties down to the three minute marker. CU worked to chip down their deficit but still trailed 48-44 entering the fourth period after TAMUC hit a three with 20 seconds on the clock. In the fourth, the Aggies grabbed a 59-55 lead after making back-to-back threes with three minutes remaining. With under a minute to go, TAMUC inched within two points. The Aggies tried to work time off the clock but committed a turnover on a pass and fouled the Lions who made both their shots tying the game at 61-all. With 22 seconds left, the Aggies missed a forced jumper sending the game into overtime. Overtime is there the Lions prevailed as they out-scored CU 18-8 for the 79-69 league opening victory. Wise scored nine points in overtime thanks to a 5-for-8 effort at the line. Davis added four points making all of her free throws. The Aggies are now 2-4 and the Lions 4-3 overall. CU will continue league action at 2 p.m. on Dec. 2 with defending Lone Star Conference Tournament champion Tarleton State. TSU is 3-3 overall and 0-1 in league play after falling to Midwestern State on Nov. 30 in Wichita Falls, Texas. The TexAnns had 18 turnovers and shot 29 percent from the floor against the Mustangs. MSU shot 47 percent and had 44 points in the paint to Tarleton’s 18 points. The Aggies have the advantage as TSU has dropped all three of their road contests this season. TSU is averaging 59.6 ppg, and is top-3 in the league’s most accurate shooters, shooting 39 percent from the field and 34 percent from three-point range, but they struggle at the line shooting a mere 66 percent.